Almond Ankle Length Combat Jeggings offering support and comfort with an elastic stretch waistband. Functional Back Pockets and mock front, side pocket and fly. 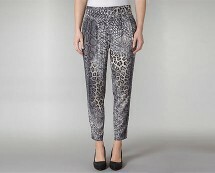 Create a fashionable look with these python print cropped leg trousers. 97% Cotton, 3% Elastane.